Aces for Athens was started at the University of Georgia in 2011 by two University of Georgia students, Nick Talathi and Taylor Bellamy, to provide extra-curricular opportunities for children with developmental disabilities in Athens Clarke-County. 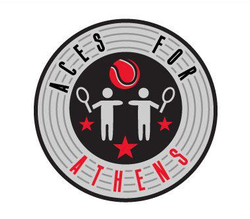 Nick and Taylor reached out to classmates and local partners in the Athens community hoping to use tennis as a vehicle to fit the two objectives of Aces. Aces was started with two objectives in mind. Primarily, Aces aimed to provide opportunities for special-needs students that they might not otherwise have had during their education. These children deserved to socialize, relax, and enjoy time outside of school just as other children were able to. Since then we have consistently been able to provide a recreational environment for these special-needs students. Secondly, Aces aimed to facilitate fitness and physical well-being through exercise in order to combat the trend of increasingly sedentary lifestyles seen in children today. We continue to work with these students in pursuit of that goal. Aces for Athens held its first lessons at Bishop Park with two children and three volunteers. After an outpouring of support and great interest among volunteers, Aces expanded to serve elementary school students as well. The founding principles remain: absolutely free lessons with all equipment provided, and a strong desire to give back to the Athens community which provides so much to the students of the University of Georgia. Please contact our executive board with any questions; we’re happy to help!